As an old Indiana Jones fan from way back, I’m a sucker for the ‘adventuring and archaeology’ theme. When such a game is made by Days of Wonder, a publisher renowned for quality and attention to detail, it’s an event tantamount to stumbling upon a previously undiscovered tomb in the Valley of the Kings! Relic Runners is on its way, and the EOG unearthed this interview with first time designer Matthew Dunstan to discover the secrets of his new game. 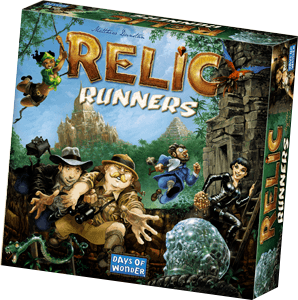 EOG: What came first when you designed Relic Runners, the mechanics or the theme? Definitely the mechanics. Actually, the first version of the game had players distributing different coloured cubes around the board at various locations—each colour of cube meant that a player could take a particular action. These cubes would remain on the locations, where they could potentially be picked up by other players, so in effect there was a sort of action market of sorts. This was linked to the need for players to always return to the centre of the board to refresh their stocks of cubes. There was a very tenuous thematic link that the players were local magicians who were spreading different types of magics around to the villages, but it was very thin. Later on, this mechanic would evolve into the temples and rations in the current game. EOG: Is the explorer theme one you’re particularly interested in? What influenced the theme—movies, books, comics etc? 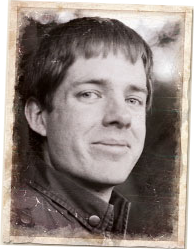 I think I am intrigued by the general theme of exploration—of seeing and discovering the unknown. However, I’m not sure if it exactly influenced the theme of Relic Runners—especially as this wasn’t the original theme of the game! After seeing what Days of Wonder has done with it, I love how the game pays homage to all sorts of popular culture references—I’m always reminded of Indiana Jones for some reason when I see the cover. EOG: Tell us a bit about the design process and the ‘Travelling Salesman’ problem. The travelling salesman problem, simply put, is a mathematical exercise that takes a map of towns connected by roads, and asks what is the most efficient route for the aforementioned salesman to visit each town at least once (there are variations of this problem, such as when the roads are different lengths, or when the salesman cannot use the same road more than once, but the general idea is the same). In Relic Runners, I sort of started out having players make many of these sort of ‘travelling salesman’ journeys—where they would be trying to efficiently visit each location on the board before having to return to the start to refuel for the next journey. In fact, a very early prototype had a scoring mechanic that tracked the locations a player had visited, and rewarded them for visiting certain sets. Inherent in the design from the very beginning was that players had to plan for what they wanted to do on each journey, and to always remember that they had to head for home before they ran out of resources, and this has been one of the constant features of the game. However, as the game evolved, the idea of having to visit many different locations faded, so much that I would say that the game is inspired by the travelling salesman problem now, rather than trying to be a game of the problem (if that makes any sense). The other main change, which played very nicely into this idea of having to plan your journeys, were the tool markers which rewarded you for travelling along certain routes (these only came into the game about half way through the design process). EOG: Tell us about the visual design of the game. What were the influences (other games, history, other objects, art, etc)? I actually didn’t have much influence over the visual design of the game—in fact, the prototype which was submitted to Days of Wonder was perhaps the exact opposite of the game as it is now. It was a mostly black and white map, printed on paper, with simple shapes drawn in Illustrator! I’m certainly amazed at the fantastic job they have done with really bringing the game to life. In part, this is due to the wonderful illustrations by Julien Delval, the artist for this game and most of the other games in the Days of Wonder line. EOG: What kind of games do you enjoy? If so, any favorites and why? Were any a particular influence on the development of Relic Runners? I think I enjoy games with interesting systems of play, which are simple to use, but have very emergent and complex behaviours as you become more familiar with the game. Games that come to mind (which I enjoy very much) are Hansa Teutonica (the really simple way players can claim routes and block each other leads to such interesting interactions) and Macao (I think the rosewheel is one of the best mechanics that Stefan Feld has come up with). I think there is quite a bit of Hansa Teutonica in Relic Runners, although it is difficult to trace the genesis of that influence (I suppose games with a map always bear some resemblance to each other). EOG: A brand new game from Days of Wonder is always an event—how did your game become one of the ‘chosen few’? To be honest, I am still is some sort of disbelief that it ever happened at all—it was certainly something I wasn’t expecting! I didn’t even submit the game to Days of Wonder—they are quite well known for not accepting outside submissions. What happened was the game had made it to the finals of a Spanish-French game design competition called Europa Ludi last year, and although it didn’t win, a representative of the competition showed my prototype to Days of Wonder at Essen last year (without me knowing). The first I heard of any of this was when I got an email from someone from Days of Wonder who had a rules question, and things progressed from there (well, once I picked my jaw off the floor). I’m just glad they saw so much in what was a pretty sparse prototype! Each game is truly different from each other, and the way the game progresses is strictly down to the actions the players take collectively. I really like how I’ve been able to combine a sort of action selection mechanism (the temples) with an exploring, route building type of game, where your options in the game are tied to your position on the board. I also really like that as the game goes on, you are able to string together such crazy turns out of many little combinations which you couldn’t have predicted from when you started the game. The other main thing I am proud of (and I’m not really sure that it can be described as a ‘mechanic’) is the emergent nature of the game. Each game is truly different from each other, and the way the game progresses is strictly down to the actions the players take collectively. There are no external influences, after the initial setup only the players’ actions influence the game, and each game the board evolves in a slightly different way. The players can both affect and react to the emergent properties of the game, and together they shape a unique experience every game. Finally, the end game is just nail biting—racing to see if you can complete that final Relic run before another player—and I love this feeling that everyone is so close to pulling out the win right up to the very end. I think this game combines a lot of different elements that people may be familiar with and enjoy—action selection, route building, resource management, tech trees—and packages all of these elements in a single system that is easy to use (so much so that you might not even realise all of these things are in the game!). Move, take an action—that’s what players do every turn. So the game is very easy to get the hang of early on (which is good when you are introducing a game to people who rarely play games, as I often do). That being said, the game also has a lot of interactions that players can discover as the play the game more and more—between the temple effects and the tool tracks there are lots of unexpected combinations that players can pull off on their turn. So the game also rewards players for repeated plays, and exploring what is possible in the game. The bottom line is that I think people should get this game because it is easy to learn (and easy to get convince your friends to play), but is different and surprising every time you play. EOG: Any plans for the future you can tease readers with? What’s next for Matthew Dunstan after Relic Runners? I’m working on a lot of prototypes at the moment, and a few of these are being considered by publishers at the moment, but there is nothing to really report now. I am working on quite a few games in collaboration with Brett Gilbert (designer of Divinare), and that has been a really interesting experience. Hopefully Relic Runners is but the first of many future games of mine—I’m keeping my fingers crossed! EOG: Thanks very much for talking with the Esoteric Order of Gamers, Matthew, and congratulations on the imminent release of Relic Runners! Thank you very much for the kind words! By the way—I love your rules summaries—thanks so much for the work you do in designing these.